in so many words...: Happy Days Are Here Again....lalalalalalalalala!! That's how I felt a few days ago, ladies and gentlemen, when I discovered that - are you ready for this? - SEASONS ONE THROUGH SIX OF THE ORIGINALLY WONDERFUL HERCULE POIROT SERIES FOR PBS MYSTERY ARE CURRENTLY AVAILABLE FOR STREAMING ON NETFLIX!!!! David Suchet and Hugh Fraser return in all their early glory. You know how lackluster I found the later Poirots - when they changed the stories so much they became almost unrecognizable AND Hugh Fraser as Hastings was nowhere to be seen, not to mention, the utterly wonderful Philip Jackson as Japp and Pauline Moran as Miss Lemon. I mean, really! Especially since I'd forgotten many of the episodes, so it will be like watching again for the first time. THE MYSTERIOUS AFFAIR AT STYLES - Christie's first ever Poirot book! 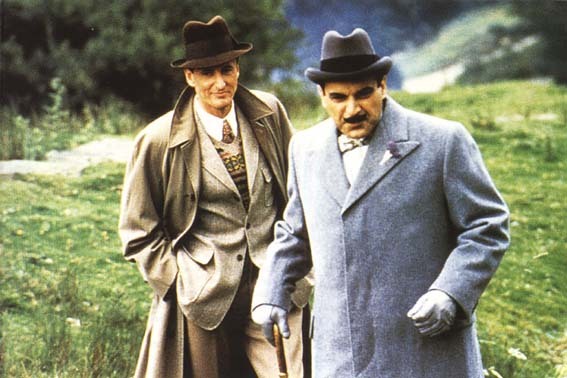 This has the wonderful scene where Poirot and Hastings meet up again after many years. Poirot is a WWI Belgian refugee in this and Hastings is a recuperating shell-shocked soldier. Who poisoned the rich, cantankerous old lady? PERIL AT END HOUSE - a beautifully produced version very close to the book and photographed in a gorgeous area of the English coast. Who is trying to kill the very sympathetic and beautiful heroine? DEATH IN THE CLOUDS - with the nasty wasp sting that wasn't. Poirot must solve a murder that takes place in front of his and every other passenger's eye on board a plane. ONE TWO, BUCKLE MY SHOE - one of my favorites that begs the question: do the ends ever justify the means? DUMB WITNESS - this was changed quite a bit from the original story, but the setting is so typically English country-side dreamy and the terrier dog is so cute, I never minded. HERCULE POIROT'S CHRISTMAS - the episode in which Poirot must show a nouveau riche family, at the dinner table, how to carve a mango - I think. That's what I remember anyway. If this is the Simeon Lee episode, then it has the same villain trick as in Christie's play, THE MOUSE TRAP. There are 32 ORIGINAL EPISODES in addition to the 10 episodes of Season One which we talked about a few months ago. Link to my original post. 42 EPISODES OF EARLY POIROT AND CAPTAIN HASTINGS AND CHIEF INSPECTOR JAPP AND MISS LEMON for viewing whenever I feel like it....You wonder that I'm in heaven?? Captain Hastings, Poirot and Chief Inspector Japp of Scotland Yard. Still from THE MYSTERIOUS AFFAIR AT STYLES, I believe. 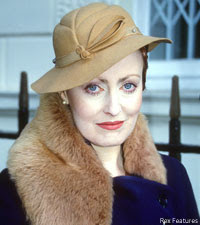 Pauline Moran as Miss Lemon who really doesn't have much to do in the books, but whose role was somewhat increased in the early episodes. The charming duo of Calvin and Hobbes (shown at the very top of the post) are the creations of American cartoonist Bill Watterson. Nice one, Yvette! Calvin and Hobbes are adorable. 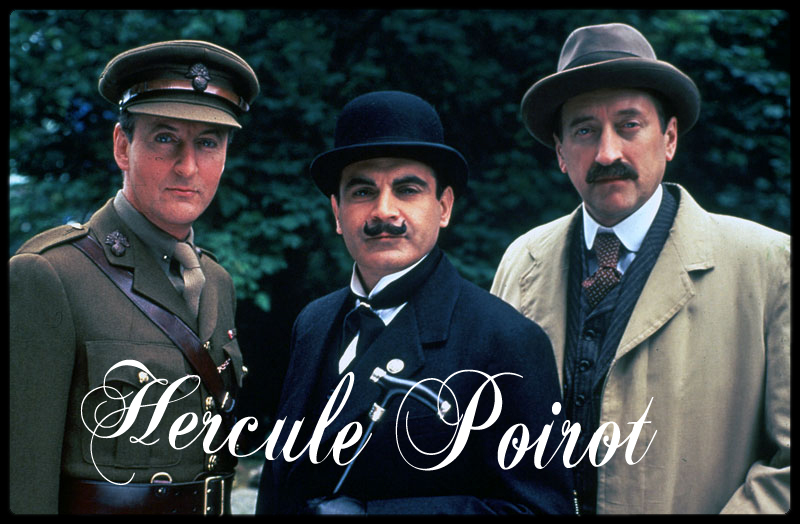 I share your excitement over the return of the original Hercule Poirot series which I remember watching in the early 1990s when cable TV had just entered our living rooms. I'd love to watch David Suchet as Poirot again except for one thing — Netflix hasn't come here yet. But I think DVD sets of this series are available in stores out here. Though, I'm hopeful that one of the English channels will run it someday considering that an early black-and-white ALFRED HITCHCOCK PRESENTS series is currently running on FX or Fox Crime channel in India. The last time I checked it was just season one available, so this is pretty exciting. I was sad that they took down all the early seasons of Midsomer Murders, though. Silly Netflix! Of course, since I can stream everything to the TV through Paul's Playstation, I wish absolutely everything were available streaming. Maybe someday. What about Amazon? You can find the dvds there - at least in this country anyway. I know, I did a little jig when I discovered the good news. But I wonder just how long they'll be available. I don't know why Netflix gives with one hand and takes with the other. Maybe it's some sort of contractual thing? Who knows. I'm just glad I watched all the early Midsomer Murders in a three or four day marathon a while back. Um, you are awesome for telling us about this! Now this is through Netflix that you can watch through Wii, right? 'Cause that's how I watch it. I'm headed there now to check it out. thank you! I just read Mysterious Affair at Styles in May. So timely! Thanks Michelle, it's nice to be thought awesome. :) I simply HAD to share this good news. Yes, Netflix has it on streaming right to your computer. Netflix may get me yet!